I know you’ve heard of ProMat. It is the leading trade show for the manufacturing and supply chain industries. 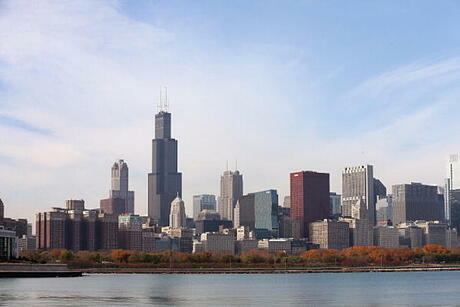 This year ProMat takes place April 8-11 in Chicago. ProMat provides attendees access to the latest material handling and logistics equipment and technologies. The ProMat Conference will include over 130 sessions and bring together leading experts from the industry to give attendees the latest information on manufacturing and supply chain trends, technologies and innovations. 1. Willis Tower - Commonly referred to as the Sears tower, which was its previous name. From the tower, you can take in some amazing views of the city and the lake. At 110 stories this is something everyone should check out at least once. On a clear day you can see as far as Michigan, Wisconsin, and Indiana from the 103rd floor observation deck. 2. Millennium Park – To me there is something special about finding some nice open space when you are in the middle of a large city. This is an urban icon of both beauty and culture with over 25 acres of awe-inspiring landscape, breathtaking architecture and public art. I try to walk through Millennium park each time I'm in Chicago. This place is a refreshing way to start your day before the hustle of ProMat begins. Be sure to grab a picture for Instagram in front of Cloud Gate, referred to by some as the giant mirror-like pill or the bean. I bet you’ve already seen this but didn’t know where it was located. 3. Chicago River - If the weather allows, I’d recommend a sail down the river to check out the Chicago architecture. On St. Patrick’s Days, the river is dyed green. 4. Wrigley Field - Heading to see the cubs is a really cool time. There are so many cool extras from Chicago hot dogs to a pint of Old Style that you may forget that a baseball game is even going on. The draw however to Wrigley has certainly ramped up since the historic world series win in 2016. For me Wrigley was certainly a bucket list check. 5. Chicago Deep-Dish Pizza – If you are not from the area and have not ever had deep-dish pizza, make sure to check out one of the few classic pizza joints in town. Remember that even a small deep-dish pie could probably feed your entire family. So be prepared for left overs when checking out Lou Malnati’s, Gino’s East, or Giordano’s.